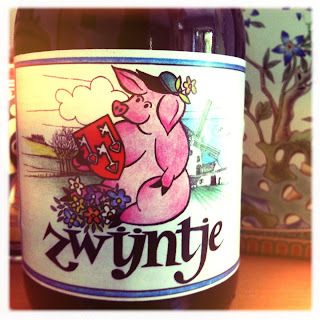 Apparently, according to Google Translate, zwijntje means either “piggy”, “a bit of luck” or “bicycle”. Judging by the label, I’m assuming the porcine option is the right choice there. The back of the bottle also says it was, gebrouwen in opdracht van de feestcommissie Zwijnaarde, or “brewed under commission by the festival committee in Zwijnaarde”. Heading over to Google Maps, I find that Zwijnaarde is a village near the city of Ghent. I think I’m correct in saying that “Zwijnaarde” would roughly translate as “swine-earth” or perhaps “swine-land”, but before anyone gets snooty about such a humble name, you should know that Wikipedia says the place is home to a science park with “a cluster of biotech companies”. So, we’ve got a beer named “piggy”, made especially for a festival in a high-tech village named Swine-land. You just have to love Belgium. But what neither Google nor Wikipedia can tell me is how a bottle of Zwijntje got in my “to taste” crate. That remains a mystery. It’s brewed by Van Steenberge, makers of many a fine beer, including Augustijn, which the back label mentions as the moederbier, or “mother beer”. I find Zwijntje slightly different, though. It is a Belgian tripel, of course, but it has a dash of lemon and honey about it that sets it apart. There’s also a stronger caramel taste and something very slightly woody about it. A bit too sweet for me, but overall, it’s not too bad really, particularly for a beer I’d never heard of before. Returning to my research, I see that Wikipedia also says the village of Zwijnaarde is known “for its fair and its Zwijntjes beer”.